Surrounded by a cache of missiles, part of an alleged Iranian arms shipment to the Gaza Strip seized on board the Klos-C last week, Prime Minister Benjamin Netanyahu harshly rebuked the international community Monday for clinging to what he said was the illusion of a changed Iran, even after an Israeli raid to intercept the ship uncovered the cache of advanced arms. 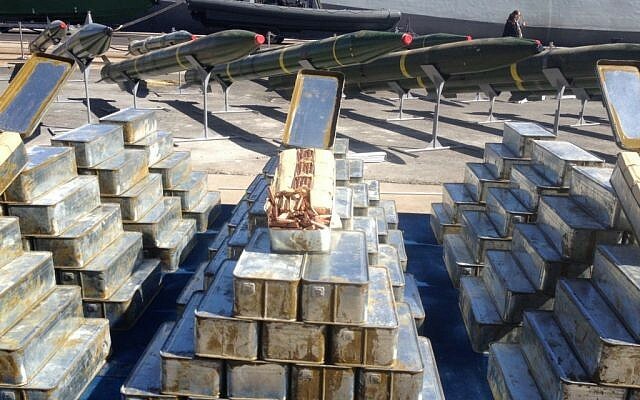 Before making his statement, Netanyahu was briefed by military officials among the rows of weapons, marked with Iranian seals, neatly arrayed at the port. The arms, the officials said, included M-302 missiles with a range of up to 160-kilometers (100 miles). The officials said the Iranian-shipped, Syrian-made missiles were capable of causing more damage than the Iranian-made M-75 or Fajr-5 missiles used by Hamas against Israel in the past. The IDF said it found 40 M-302 rockets aboard the Panamanian-flagged Klos-C it intercepted in the Red Sea last week, as well as 181 120-mm. 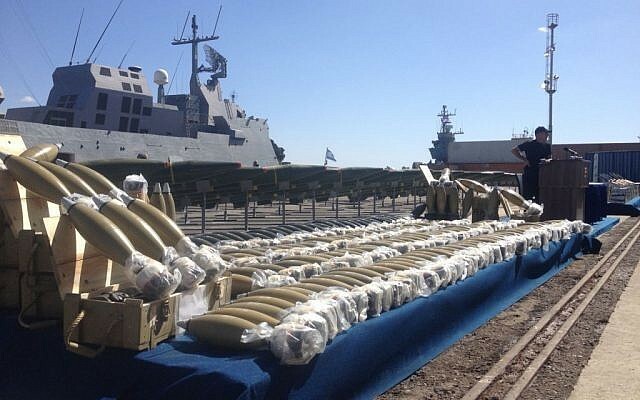 mortar shells and approximately 400,000 7.62-caliber rounds. IDF spokesperson Lt. Col. Peter Lerner said the mortar rounds had been made in Iran. Before he spoke to the press, IDF officers showed Netanyahu documentation they said confirmed the Iranian origin of the shipment. With a grave expression, the prime minister blasted Western leaders for “smilingly shaking hands” with Iranian leaders even as the missiles were being unloaded at Israel’s southern Eilat port — a shipment as heavily masked, Netanyahu said, as Iran’s nuclear program. He was referring to a European Union delegation led by foreign policy chief Catherine Ashton, who arrived in Iran Sunday for her first visit to the country – the first European diplomat in her position to do so since 2008 — and held a joint press conference with Iranian Foreign Minister Mohammed Javad Zarif. Calling on the international to wake up and see the truth behind “Iran’s fake smiles … before it’s too late,” Netanyahu said world powers must stop Iran from achieving military nuclear capabilities. 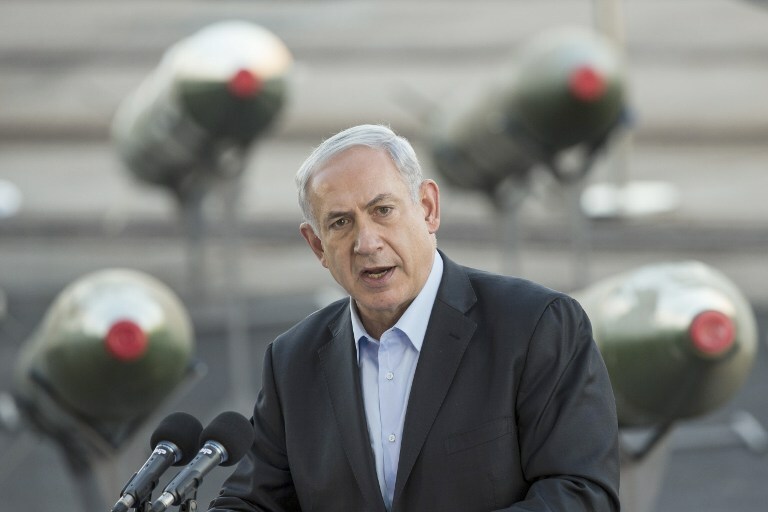 “They would like to continue to build up the illusion that Iran has changed course, but the facts we see on this pier prove the exact opposite,” Netanyahu said. He said there was conclusive proof, including testimony by the ship’s crew, that the weapons containers were loaded onto the Klos-C in Bandar Abbas, Iran’s largest port. He said the ship’s bills of lading, both real and fabricated, showed that Iran had tried to mask the contents of the shipment — precisely as it masks its nuclear efforts. “Just as Iran tried to camouflage this deadly weapons shipment, Iran camouflages its military nuclear program,” he said. “The international community would like to ignore Iran’s continued criminal hostility; the massacre it is helping to commit in Syria; its support for terrorist organizations in the Gaza Strip and Lebanon,” said Netanyahu. “There are those who would prefer that we not hold this news conference here today,” he added, addressing the foreign press in English. “They feel uncomfortable. 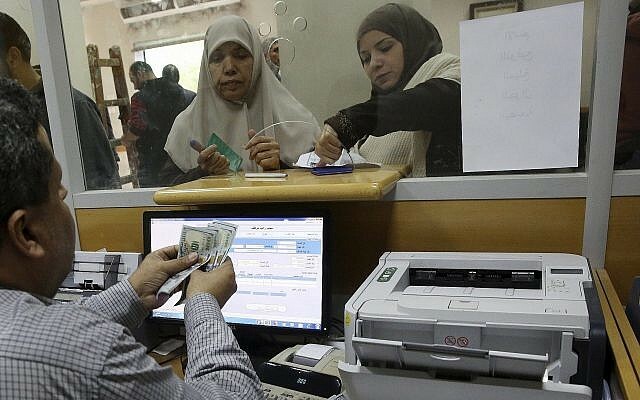 They would prefer that we continue to nurture the illusion” of a new, moderate Iran, he added. The prime minister said that the West was also keen to overlook human rights violations within Iran, such as the hundreds of executions that take place in the country each year. He said that when it came to Israel, on the other hand, the international community loudly condemned even the smallest violation. “The condemnations I’ve heard from the international community in the face of this murderous shipment have been limp, few and far between,” Netanyahu said. Also speaking in Eilat on Monday afternoon was Defense Minister Moshe Ya’alon, who said Iran’s “charm and smile offensive” did little to conceal its long-term goals, which remained unchanged under President Hassan Rouhani. These goals, said Ya’alon, included “disseminating the revolution,” “challenging the ‘Great Satan,’ or the United States and Western culture,” and undermining regimes in the Middle East. “There is no conflict in the Middle East, from Afghanistan through Bahrain and Yemen to Syria, Lebanon and the Gaza Strip, where Iran isn’t fanning the flames,” Ya’alon said. He added that Iranian terror proxies were active in Asia and South America as well, and that the regime’s smiles masked continued activity on the terror, missile development and nuclear fronts. 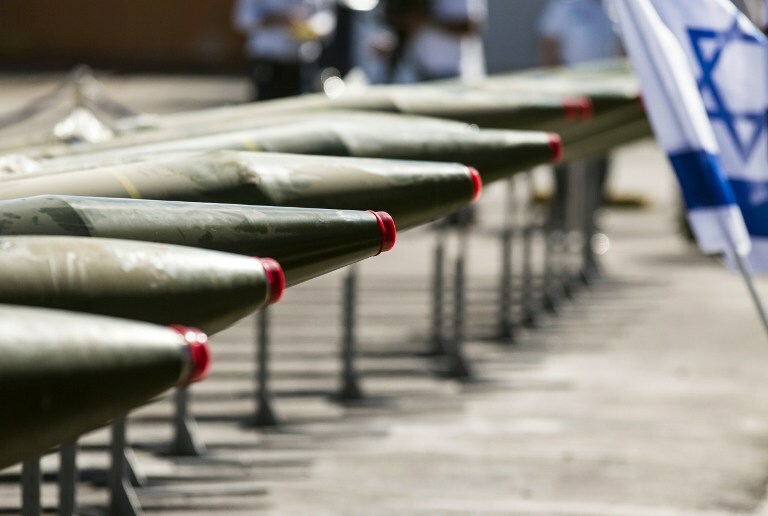 As Netanyahu and Ya’alon spoke, dozens of rockets, boxes of hundreds thousands of bullets and nearly 200 mortar rounds were opened for the world to see as Israel put the seized weapons from the Klos-C on show. 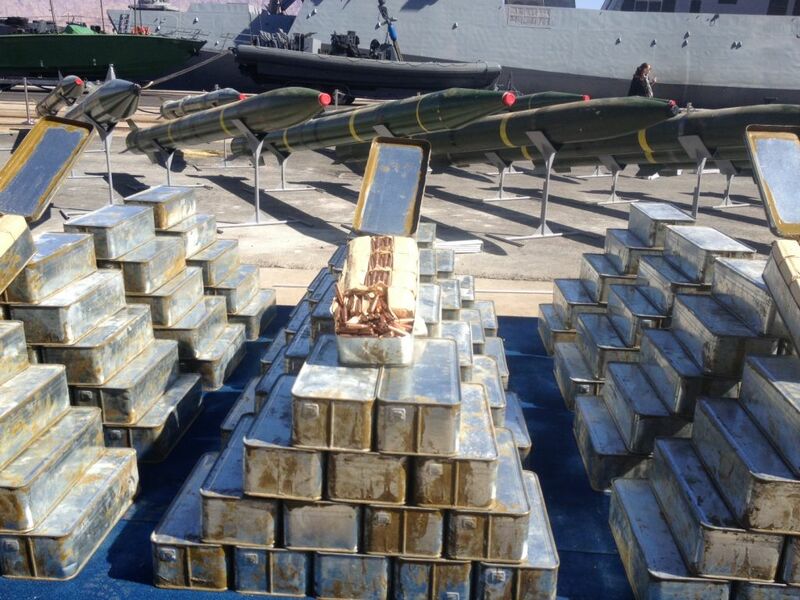 The arsenal was presented at a news conference at a naval base in the southern port city of Eilat by Netanyahu, Ya’alon and navy chief Vice Admiral Ram Rutberg. 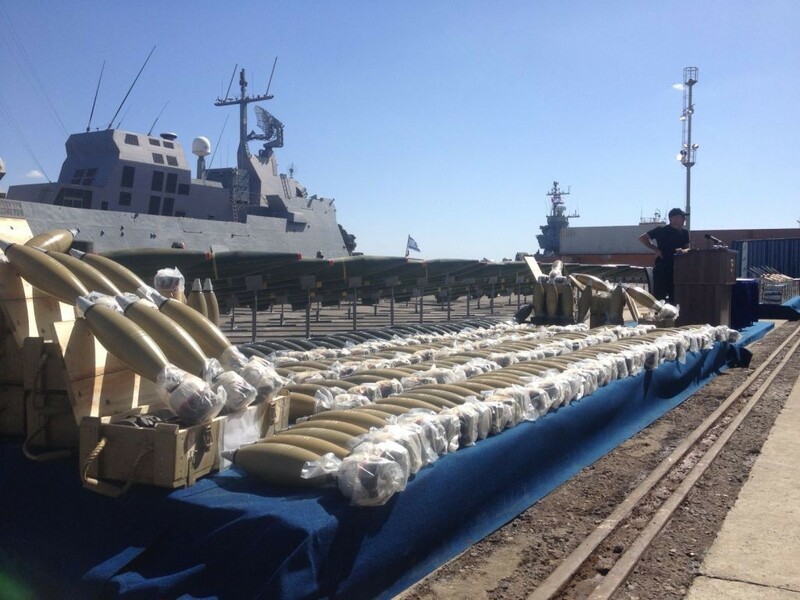 Journalists invited to the press conference were shown rows of armaments set up on a military dock, next to the Hanit navy boat, which intercepted the arms ship on Wednesday. “Each one of these rockets poses a threat to the safety of the citizens of Israel — each bullet and each rocket that was discovered had an Israeli address,” army chief Lieutenant General Benny Gantz said over the weekend. If fired from Gaza, M-302 rockets, which have a range of 160 kilometers (100 miles), could easily reach Tel Aviv. Ambassadors and military attaches were also taken to see the haul on Monday afternoon, as Israel sought to demonstrate evidence of Iran’s ties with terrorist groups. World powers are currently engaged in talks with Iran to roll back its nuclear program in exchange for sanctions relief. But Israel, which believes Iran is trying to build a military nuclear capability, has lashed out at the negotiations, arguing that the West is being duped over Tehran’s true intentions. Mitch Ginsburg and AFP contributed to this report.